Many patients with head and neck cancer experience long-term physical and psychosocial symptoms; SCPs can benefit them. DENVER, CO — Disease-specific survivorship care plans (SCPs) for head and neck cancer support a successful transition to a healthy lifestyle after curative intent therapy of larynx and oral cavity/pharynx cancer, according to a presentation at the 2017 Oncology Nursing Society Annual Congress. The Institute of Medicine describes survivorship as a distinct phase of cancer care and recommends that all patients receive survivorship care plans (SCPs). The American College of Surgeons (ACOS) standards require that all patients who undergo curative treatment for cancer receive SCPs on completion of therapy, with 100% adherence expected by 2019. An estimated 12,430 cases of larynx cancer and an estimated 48,330 new cases of oral cavity/pharynx cancer were diagnosed in 2016. Despite receiving treatment with curative intent, many patients with head and neck cancer experience long-term physical and psychosocial symptoms that can impact their quality of life. Minoka Hicks, RN, BSN, BA, OCN, and colleagues at Duke Cancer Institute in Durham, North Carolina, sought to determine the early survivorship needs of patients with head and neck cancers to better design disease-specific survivorship care plans. For this study, they gave anonymous needs assessment surveys to patients with head and neck cancer in medical oncology, radiation oncology, and otolaryngology surgery clinics, with a response goal of 30-50 individual patients. The survey queried participants about healthy lifestyle behaviors, their knowledge of late/long term adverse effects, and posttreatment health care follow up recommendations. The researchers utilized the American Society of Clinical Oncology (ASCO) SCP template for base content. But the multidisciplinary team plans to compile their survey results to create a detailed, disease-specific SCP for head and neck cancers. The team will then design a clinical study to compare their enhanced SCP with SCPs based on the ASCO template. Long term/late adverse effects experienced by patients with head and neck cancers include musculoskeletal changes, lymphedema of the neck, xerostomia, dental caries, osteonecrosis, hypothyroidism, and depression/anxiety. Health promotion considerations for SCPs include smoking cessation, alcohol cessation, healthy weight and nutrition, and physical activity/exercise. 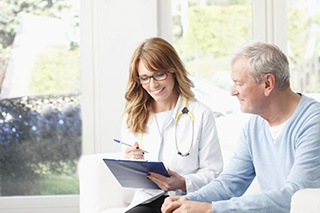 As part of the SCP program, the patient’s primary care physican will be included in the recovery process early in order to facilitate the patient’s transition to a healthy lifestyle, rather than cancer-focused long-term care. SCPs specific to head and neck cancer allow oncology nurses to coordinate care between the oncology team and primary care, and improve patient education about survivorship and long-term care. 1. Hicks M, Tenhover J, Allen DH, Hillson J. Survivorship care plan needs for head and neck cancer patients. Oral presentation at: 2017 Oncology Nursing Society 42nd Annual Congress; May 4-7, 2017; Denver, CO.